Package: Brand new boxed and sealed. 9 programmable buttons including Precision Aim. 3 lighting zones with red LEDs. Mad catz RAT4 5000DPI precision aim. Wired optical pro gaming mouse. 5000 DPI Optical Sensor - PMW 3310. The RAT4 is precision engineered forperformance gaming. 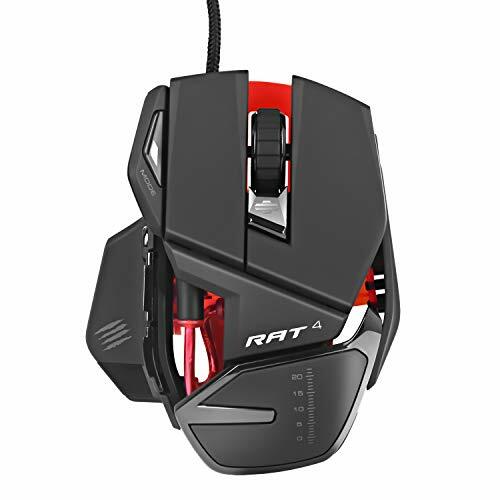 Fitted with the most respected optical sensors available, 3illumination zones, and superior switch components, RAT4 delivers theperformance and customization demanded by gamers. The sleek design,cutting-edge form factor and a host of programmable action buttons help youkeep ahead of the competition no matter what the game.